We should refrain ourselves and instruct others to refrain from the writings, speeches and programs of Javed Ahmed Ghamdi who is the head of Al Mawrid Institute Lahore, Renaissance, Understanding Islam, Islamic Issues ets. The gentleman and his affiliates are deviants to the extreme of rejecting the Nasoos of the Quran let alone the Hadith. Ghamdi has insulted the Ulemas of Deoband in his book burhan. Apart from this he is flying high these days by coming on TV brought by GEO Television. 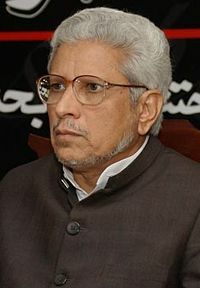 Mr. Ghamidi has special interest in Asma Jahangir and Qadinyanis much of whose ideology is reflected in his articles. Ghamidi's books are Bayan, Mizan and Burhan, the last one being a mockery of Islam, Prophets, Companions, Imams, Muhaditheen and Mufasereens. They are seldomly available in Pakistan but are available at Danish Sara which are regional centers for Ghamidi's Operations. The aim of this posting is to request all members not to fall into the traps of Ghamidi. At present he is being fully supported by the Qadiyani Lobby against the Hudood Ordinance. The next target given to GEO and Ghamidi is surely to fight against the 295-C Blasphemy Law, to accomodate Qadiyanis. Ghamdi does not claim to refute the status of Hadith directly yet he takes it a stage further ahead and categorizes hadith as something from which Ahkaam (Rulings) cannot be drawn and only Quran is the orignal source. He goest on to say that some Ahadith have been misinterpreted by ALL (yes ALL) the Imams, Mufasirs, Muhaditheen, Fuqah, Ulemas etc. To quote an example is his refutation of the Hadith that says (it is a Mafhoom) Whosoever Changes His Faith, Kill Him. According to Ghamidi the ruling on Qital (Killing a Person) when he becomes a Murtad (Apostate) doesnot apply to present times. It was restricted to the time of Holy Prophet Salal Lahu Aalahi Wassalam and after that it had become Mauqoof. (Burhan, by Ghamidi). Ghamidi says that this Hadith has been misinterpreted by all the Ulemas for 1200 years wherein the meaining of Umoom (Generality) has been taken at large. Therefore he concludes that a person cannot be executed if he decides to change his religion from Islam because there is no evidence of it in Quran and Sunnah. Ghamidi and his disciples also use the word Quran and Sunnah and separate Hadith from Sunnah. He calls them the Shabistan Shibli of Knowledge and hails them as the reformists of this time. He has castigated Maulana Rashid Ahmed Gangohi (RA), Qasim Nanatwi (RA), Shaykh ul Hind, Syed Hussain Ahmed Madani, Maulana Ashraf Ali Thanwi, Allama Shabbir Ahmed Uthmani and calls them Bigots. According to Ghamidi this group of people (Deobandis) are like an old building with rotten foundations that will become empty by itself through passage of time. Ghamadi enjoys special company with Robert Spencer and Danielt Pipes. What is interesting is that Ghamdi and his associates particularly Moiz Amjad have tried to defend Islam against the criticism of Daniel Pipes and Robert Spencer and have miserably (deliberately) failed! In fact they have subscribed to the views of these two critics with special reference to the 7 Recitations of Quran, which according to Ghamdi and his teachers are practices of Juhul and have no place in Islam.